As the European round of the championship continues, next up on the calendar is the iconic British Grand Prix. Over the years, the race has built up reputation as among the most crucial and beloved races of the season. Silverstone, the circuit which has hosted most of the British Grands Prix, will take hosting duties once again this season. The 5.81 miles circuit has provided much excitement over the years, with several dramatic and memorable races. This year, Mercedes’ Lewis Hamilton will start as defending race winner. In fact, Hamilton has already won this race thrice and will try to equal Nigel Mansell’s record of four wins at this circuit. Besides Hamilton, Fernando Alonso has won here twice, while Nico Rosberg, Sebastian Vettel and Kimi Raikkonen have all won this race once. 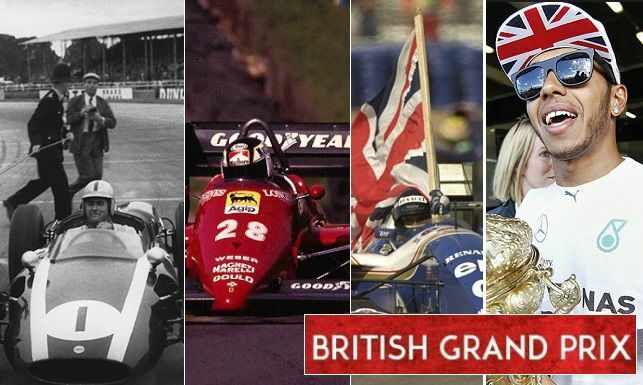 Below is a look at several astonishing facts which make British Grand Prix special to millions of F1 fans around the world. Having been part of Formula 1 continuously since its first season in 1950, the British Grand Prix, alongwith the Italian Grand Prix are the two oldest rounds on the calendar. Over the years, the race has been held at Aintree, Brands Hatch and principally at Silverstone. Silverstone has hosted most races so far and has remained on the calendar since 1987. Not only has the Grand Prix been part of the calendar since inception of Formula 1, but also it was the first race ever which was given the official designation as the first F1 race ever. Coincidentally, the Silverstone circuit where the race is currently staged, was also the host when the first race was held here in 1950. Although the track has been altered over the years, but still it continues to retain its characteristic of being one of the most fast flowing circuits on the calendar. Alongwith tracks like Monza and Red Bull Ring, it is one of the few circuits, where an F1 car reaches the highest speeds it can possibly achieve. The Maggots corner on the circuit is one of the fastest in the world, with F1 cars registering speeds of upto 180 mph. The current lap record is held by Australia’s Mark Webber, who set the fastest lap while driving for Red Bull in 2013. Initially it was the Italians, who dominated Formula 1 and motorsport in general, but in the late 1950s, tide started to shift as Britain became more dominant. It was the British Grand Prix, which proved to be impetus for several teams and drivers, who went on to achieve unprecedented fame and success in their careers. It was the spectacle of British Grand Prix which influenced several of the Britishers to take up this sport professionally. Thus it is no mean feat that over the years ten British drivers have won sixteen titles in total and while ten British teams have won thirty three titles, the most any nation has managed yet. The country continues to play a major part in Formula 1 racing as three drivers and seven of the eleven teams are British. Further, the headquarters of Force India is located nearby the circuit itself. The British Grand Prix has influenced numerous generations in Formula 1 and will surely continue to do so in the future too. Although, the number of spectators attending a Grand Prix has been decreasing consistently in several countries on the calendar, but that trend seems not to apply to Silverstone. Even though the tickets to attend a Grand Prix continue to remain expensive, but in countries like the U.K., this does not seem to have much of an impact. In fact, in 2015, around 140,000 people attended the race, most for any race that season. That trend hasn’t been a one off, but historically too the British Grand Prix has attracted amongst the highest crowd attendances ever for a Grand Prix. Almost every year, the 100,000 barrier has pretty much every year been crossed in terms of circuit attendance. Keeping that trend in mind, a similar crowd is also expected this year too, especially with the home hero Lewis Hamilton being in winning form over the last few races.